AirCraft is DroneBase's premier augmented reality (AR) platform that expands the realm of possibilities for drone users. With AirCraft, Pilots can use their drone to build virtual objects in the sky. 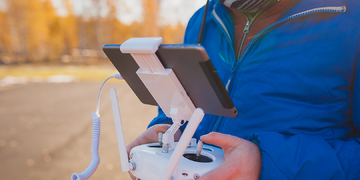 Anyone with a DroneBase account, a compatible mobile device, and a compatible drone can use AirCraft for free...and it's hobbyist pilot-friendly too! Because you don't need a license to play around with our AR, even the newest users can start flying with DroneBase. We've had a great response to AirCraft so far. Take Trent, for example, who already made a video to share the structures he's created! We're excited to keep this momentum going, and wanted to share some high-level tips for first-time AirCraft users. To make using AirCraft as seamless as possible, here are a few step-by-step directions to get you used to the basics of using your drone to construct Augmented Reality. You can select an object from the toolbar at the bottom of your screen. Tap an object to select it. You can swipe left and right to see more sizes, and you can swipe up and down to see more colors and textures. Once an object in the toolbar is selected, tap the green plus button to place it anywhere in the sky that you'd like. If you use the crosshair to highlight the side of an existing object, then a new object will snap directly onto it. Highlight the object you want to remove with the crosshair, and then tap red X button. If your drone's controller has programmable buttons, you can also use the C1 and C2 buttons to delete and place objects. In "aircraft", "AR", "Drone Pilots", "Uncategorized"
Previous PostWhat Are the Most Common Causes for Drone Crashes? Next PostWhich Drone is Right For Me?